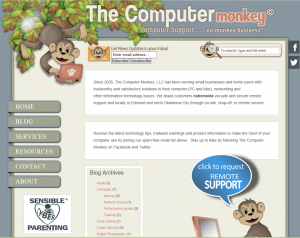 The Computer Monkey, LLC has been in operation since 2005 and is owned and operated by Diana Giles who has a bachelor’s in business administration and a master’s in telecommunications management from Oklahoma State University. She lives in Edmond with her husband and two sons. She has worked in the field of information technology since 1993. While completing her master’s degree she served as a full-time faculty member at OSU’s Oklahoma City campus, where she taught LAN fundamentals, Telecommunications and UNIX. The words used on this site are used in their usual meaning and context. Personal pronouns such as “we” or “our” are meant to refer to “The Computer Monkey, LLC,” while “you” means a customer or visitor to the web site. The Computer Monkey, LLC does not, and cannot, represent or endorse the accuracy or reliability of any of the information contained on this website which comes from a source other than The Computer Monkey. By any use of this site you hereby acknowledge, that Information downloaded, or accessed from any links contained on this website, and any information, software or other material downloaded from this site, may not be uninterrupted, free of viruses or errors or other harmful components; that any reliance upon any information from said sites shall be at your sole risk. The Computer Monkey only warrants its own work. The Computer Monkey, LLC reserves the right, in its sole discretion and without any obligation, to make improvements, corrections, additions, changes or deletions to any information, error or omission, in any portion of this website at any time without notice. If we make any material change, we will update our web site to include such changes and how they affect the security and disclosure of your personal information if applicable. “The Computer Monkey, LLC” is a properly registered trade name with the Secretary of State of Oklahoma. The logo of “The Computer Monkey” and web pages are copyright owned by Diana Giles. “The Computer Monkey” is the official service mark of this business with appropriate registration applied for. The Service Mark of “Sensible Cyber Parenting®” is wholly owned and registered to Diana Giles. If any visitor finds information that may be an infringement on copyright, please use the comment form of this web site to contact The Computer Monkey, LLC so that this can be quickly addressed. You can visit The Computer Monkey on the World Wide Web without telling us who you are or revealing any information about yourself. If you choose to provide us with additional information about yourself through an e-mail message, we will only maintain the information as long as needed to respond to your question or to fulfill the stated purpose of the communication. In those cases, the web server on which this site is hosted may collect the name of the domain you used to access the Internet (such as yahoo.com) and the web site you came from and visited next. This information may be used to measure the number of visits, average time spent, page views, and other statistics about visitors to this web site in general. The Computer Monkey encourages you to exercise discretion while browsing the Internet using this website. Many links from this site lead to servers maintained by individuals or organizations over which The Computer Monkey has no control. While we strive to protect our customers, other sights may not exercise the same level of effort. As a consequence these sites may contain information that some people may find offensive or inappropriate. In that case, The Computer Monkey makes no representations concerning any endeavor to review the content of sites listed in the website and so The Computer Monkey cannot be held responsible for the accuracy, copyright compliance, legality or decency of material contained therein.